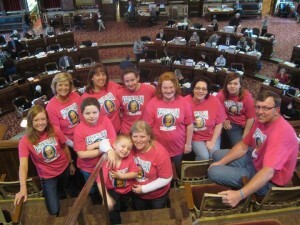 Eleven people wearing matching pink t-shirts sat in the Iowa Senate’s balcony this morning to watch lawmakers pass a school bus safety bill. The group started a lobbying campaign on the issue in January, motivated by the death of seven-year-old Kadyn Halverson of Kensett, which is in north central Iowa. She was killed by a hit-and-run driver last May as she tried to board her school bus. Her mother, Kari Halverson, spoke with dozens of legislators personally, urging them to pass a bill that toughens penalties for those who pass stopped school buses. The family also wants video cameras installed in school buses. Kathy Meyer, Kadyn’s grandmother, says video cameras will help enforce the tougher new penalties. The bill calls for a study of placing cameras in school buses. The pink t-shirts worn by Kadyn’s family and friends feature a photo of the girl, wearing her backpack and standing in front of her school bus. Three girls who went to school with Kadyn were in the senate today to see the bill pass, including 10-year-old Ambur who rode the bus with Kadyn. “We wanted to see them debating on Kadyn’s Law,” she said. Ambur’s mother, Kim Koenigs, said she and her daughter talked about Kadyn as they drove to Des Moines this morning. Koenigs helped craft the lobbying strategy for the family which included a pink binder filled with information about school bus safety, and a poignant letter from Kadyn’s mother. The bill passed the Senate unanimously. Similar legislation is pending in the House.